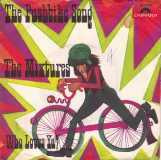 Only five songs with a mode of transport in the title have reached number two, Johnny Duncan was the first, and the only one of the fifties, with Last Train To San Fernando, Peter Paul and Mary did it in 1970 with Leaving On A Jet Plane, The Mixtures’ Pushbike Song freewheeled to number two in 1971, The KLF’s took the Last Train To Transcentral, wherever that is, in 1991 and finally Nicki Minaj did it in 2012 with Starships. For those who are off to check for anymore, yes, I could have included Crazy Horses and Rocket Man, but didn’t really think they qualified! This week I delve into the third one of that list. According to historian Noel McGrath, the Mixtures had its origins in a chance meeting between Melbourne vocalist Terry Dean and Tasmanian-born bassist Rod De Clerk, who met while Terry was holidaying in Tasmania in 1965. Rod sought Terry out when he visited Melbourne a short time later and Terry took him to a dance where he was performing. It was here that Rod was introduced to guitarist Laurie Arthur, who had been a founder member of leading Melbourne band The Strangers. At the time, Laurie was subbing in a group that included John Creech on drums and as the three chatted between sets they soon discovered that they shared similar tastes in music. They jammed together after the show and decided on the spot to form a group. They began making a name for themselves and gained extra kudos when they supported the Walker Brothers on their Australian tour. By 1967, there was a change of personnel with Mick Flynn replacing De Clerck, Fred Weiland replacing Arthur (who took over as the band’s manager) and organist Dennis Garcia being added. A few months later, Garcia left and was replaced by Idris Jones. By 1970, there were even more changes and when Gary Howard replaced Creech it meant that there were no original members left in the band. They release a couple of singles with average success but by their third, which was called Music Music Music, in March 1967, they had expanded to a four-piece when they re-added organist Dennis Garcia. In the summer of 1970, Mungo Jerry topped the UK singles chart with In The Summertime and spent seven weeks there, but in Australia at the time there were problems with radio broadcasters who seemed to be at war with many of the major record labels over royalty rates for the airing of records and many British recordings were banned from the airwaves, so the Mixtures recorded a cover version of In The Summertime which topped the Australian chart. Band member Idris Jones wanted to quickly follow-up that success and asked his brother Evan to co-write a song with a similar sound. The brothers, originally from Adelaide, had both been in a band called the Gingerbread Men and they came up with The Pushbike Song. The Australian record-buying public obviously liked the sound and bought enough copies to give the Mixtures their second chart-topper. The band began recording tracks for their album at Armstrong’s Studios in Melbourne but then, to cash-in on their success, they travelled to the UK and finished the album at Morgan Studios in London. They weren’t called The Mixtures for nothing, as soon as they arrived in London, Jones decided to leave and was replaced by Greg Cook and Mick Holden was brought in the replace the sudden departure of drummer Gary Howard. With a complete change of heart, Jones felt he was missing out, so travelled back to the UK to re-join the band. Somehow they stayed together until 1976 and no fewer than 15 different member passed through the ranks of the Mixtures. The Pushbike Song has been covered numerous times, not least in a novelty way by Pinky and Perky and then by The Wurzels, who retitled it I’ll Never Get A Scrumpy Here. There were more serious versions by The New Seekers, Anita Harris and, bizarrely by Olivia Newton-John whose version featured in the 2011 film that she also appeared in A Few Best Men. In 1990, Ray Dorsey, of Mungo Jerry, agreed that he rather liked the Pushbike Song and eventually covered it, “as a tribute” and it appeared on their 1990 compilation All the Hits Plus More.